There's a great giveaway contest going on to usher in a new online community created by Verizon Wireless and fueled by consumers called Livin' in 4G LTE. Verizon Wireless encourages everyone to participate. 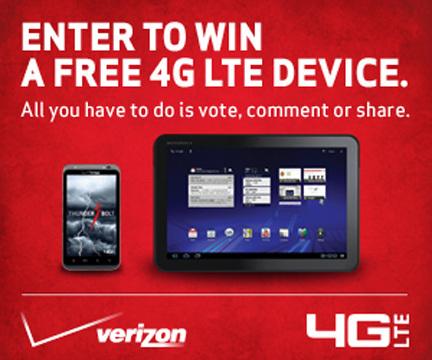 Just by voting, sharing or commenting on the videos and content on this new Verizon Insider micro site, you'll earn a chance to win a Verizon 4G LTE. This family friendly YouTube vignette is just one of the many you'll be able to view on the site. In fact, each time you vote, share or comment, you’re entered into the sweepstakes for a chance to win one of five weekly prizes. Click to enter and vote – it’s that easy! Weekly prizes in this contest include the HTC Thunderbolt, Samsung Droid Charge and Motorola Xoom. Plus they're throwing in some device-protection such as Otterboxes, Jawbone headsets and $125 Verizon Wireless gift card prizes too. FTC Disclosure: I am receiving compensation from Verizon Wireless in association with this post. However, the content in this blogpost is written in my own words. See complete FTC Disclosure information that appears at the bottom of MommyBlogExpert's main page and at the bottom of every individual post on this blog, including this one.